Alright, friends, you’ve picked out your paints, you’ve put them in your palette (the right way! ), and now it’s time to talk paper. Choosing professional watercolor paper makes a heck of a difference in the quality of your painting. This might be the most important aspect in creating profesh paintings (although proper paint and brush selection is still super critical!). For this post, I created a fun little demo so you can see the differences for yourself. Let me drop a few knowledge bombs on you first, then we will get to the demo! There are three main types of watercolor paper texture: hot-pressed, cold-pressed, and rough. I am going to break these down below. Hot-pressed paper has a smooth surface that is not very absorbent. This type of paper is best suited for wet-on-dry technique, when you’re not using a lot of water and don’t want your colors to softly blend into each other like they do with wet-on-wet. I rarely use hot-pressed paper, as most of my paintings feature wet-on-wet technique. There are pros and cons to using smooth paper. Your colors look more vibrant and there’s no visible texture, so your art really pops. This is great if you scan your paintings for digital use. This paper is great for layering with gouache paint (opaque watercolors) or adding very fine details. Not absorbent. If you use too much water, it tends to puddle and dry with harsh lines. Not great for wet-on-wet technique, and hard to get a soft-blend. Cold-pressed paper falls in between hot-pressed and rough in regards to texture. This is the most common paper used by watercolor artists, as it works well with both wet-on-dry and wet-on-wet technique. I only use cold-pressed paper, because I love the texture and it works well with my style of painting. Perfect for wet-on-wet or wet-on-dry technique. Fabulous for novice watercolor artists, as high-quality cold-pressed paper can allow you to remove some mistakes. Texture can be hard to get rid of in scans (I don’t mind this, but some artists prefer no texture). Might need to be stretched if you are not buying it in a block. I will do a post on stretching your paper in the future! Rough paper is toothier than cold-pressed paper, allowing pigment to sink deeper into the fibers of the paper. This is excellent for wet-on-wet application where you are using a lot of water. Very absorbent for wet-on-wet application. Removing unwanted paint is more challenging, since the pigment sinks deep into the paper. Not great for fine details or line work, as the toothiness can make them look shaky. Not great for scanning artwork, as you will have a LOT of texture in your scans. Watercolor paper comes in three main weights: 90lb, 140lb, and 300lb. Any weight below 140lb isn’t ideal for watercolor painting, because it won’t absorb the paint and water properly. Lightweight paper is better suited for making prints of your artwork. Paper that is 140lb to 300lb is ideal for watercolor painting, and choosing a weight depends on how much water you plan to use. If you are using a LOT of water (common with liquid wet-on-wet watercolor techniques) or applying several glazes, 300lb paper is ideal. If you plan to do light wet-on-wet with finer details, I recommend selecting 140lb. I almost exclusively use 140lb paper, and this is what I am including in my demo today. You can purchase 140lb and 300lb paper by the sheet or in blocks, pads, or rolls. If you purchase a pad or roll of 140lb paper, stretching is recommended prior to use to avoid buckling. Heavier 300lb paper does not need to be stretched prior to use. I mainly purchase 140lb cold-pressed paper in blocks, so I do not need to worry about stretching. Now that we’ve got the technical stuff out of the way, let’s get to the fun stuff! I did a quick little demo on four different papers to show you the differences between them. 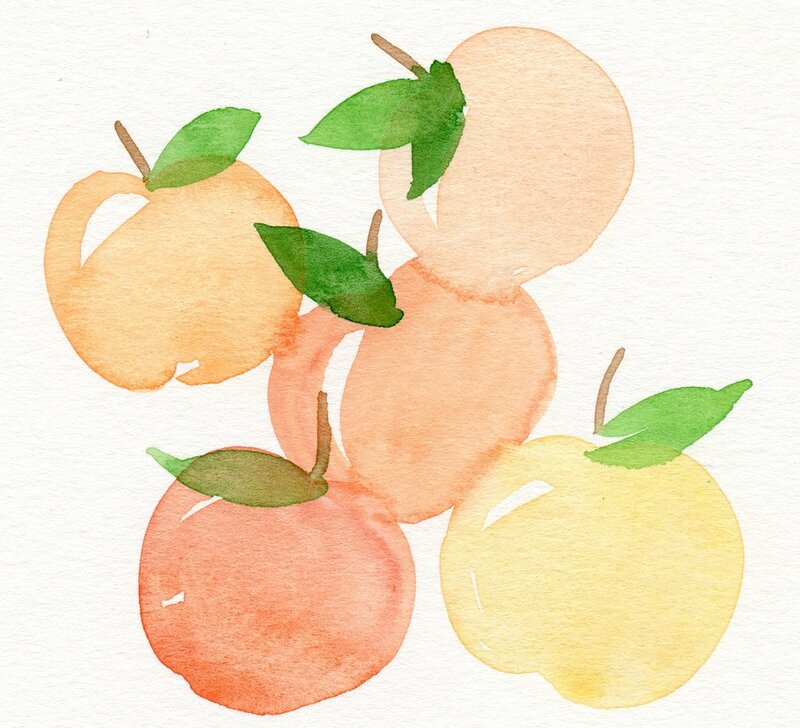 On each paper, I painted little overlapping peaches in varying shades of orange (using wet-on-wet and wet-on-dry) and scanned the finished pieces in. First up, I will start with a side-by-side comparison of my two favorite professional paper brands, Legion Paper (Stonehenge) and Arches . Both of these papers are cold-pressed and 140lbs. The pieces look very similar, although Legion paper is brighter white and has a bit more texture (which I love). Side note: I used to be a die-hard Arches girl, but lately I have been having a love affair with Legion (it’s also less expensive - score!). I purchased a roll of Arches awhile ago, but once I finish it, I think I will be making the switch to Legion full-time. Second, I had a sample sheet of Legion’s hot-pressed paper, and I used that for this painting. As you can see, the colors are very vivid, but the wet-on-wet technique did not create a soft diffusion between the peaches like it did with the cold-pressed. Lastly, I used an old pad of Canson 140lb cold-pressed paper, to demo the difference between cheap watercolor paper and professional paper. Canson is a common student-grade paper you can pick up at most art supply stores. This paper can be great for a quick sketch or practice, but there is a drastic difference in quality between Canson and professional paper. See below for a side-by-side comparison of Legion vs. Canson. To sum it up, paper selection makes a HUGE difference in your artwork. There are tons of brands out there, but choosing a high-quality paper really gives your watercolors that bump from novice to pro. I highly recommend Legion and Arches (here’s me shouting this from the rooftops - it’s that serious), but if you choose a different brand, be sure that your paper is 100% real cotton and acid-free to prevent yellowing over time.